That’s right! 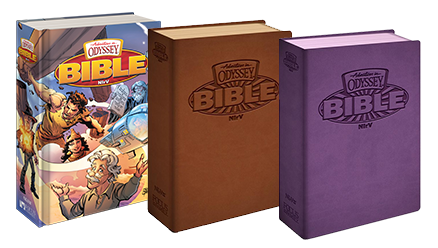 We previously announced that the Odyssey team would be releasing a brand new Adventures in Odyssey Bible, and that time is now! It has been 17 years since Focus on the Family released an AIO Bible, and the team has done a fantastic job putting this one together. 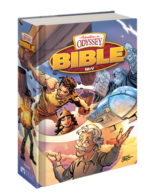 Fans, you can now order the NIrV Adventures in Odyssey Bible, exclusively available through Focus on the Family. The Bible is available in three options: hardcover or your choice of brown or purple Italian leatherette. This full color Bible combines the bestselling, kid-friendly New International Reader’s Version text of both the Old and New Testaments with more than a thousand features meant to excite and encourage you to read and apply the Scriptures. Recurring features like Whit’s Wisdom, Candid Conversations, Wooton’s Fun Facts, Jason’s Jargon, and “What’s It Mean, Eugene?” will keep you turning the pages, reading the biblical text, and growing in your understanding of God’s Word. This great new product is a great tool for kids (and families) to study God’s Word together. It is absolutely beautiful from cover to cover. When the Odyssey team puts a product together, you can always expect a high quality piece.